We know building your business is hard work, but keeping your website up to date shouldn't be. That's why we created the 3plains CMS (3plains Online Portal), and filled it with powerful tools that make it easy to manage the content on your website. 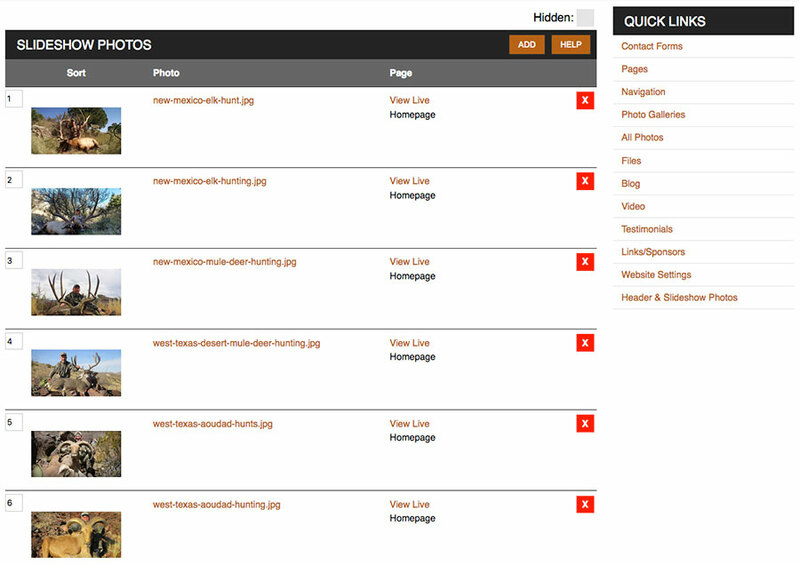 Whether it's adding a new page, uploading this season's photos, or writing a new blog post, our system has you covered. And you do it all right from your own website online! 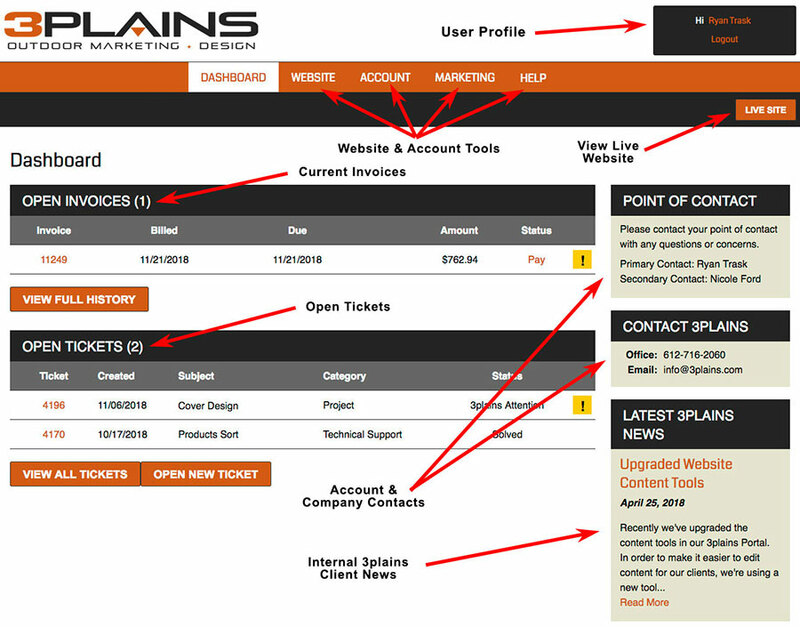 Manage your 3plains account and website from one account. We also have a toggle built in for multiple websites under one business account. Clients make your business go and the 3plains CMS helps you manage contacting your potential clients. Website contacts automatically appear in the lead manager and you can enter customer info from telephone inquiries or trade shows. We setup a default contact form for each of our customers website. You have the ability to control fields, marketing message, who the form goes to, auto-responder email and thank you message. You can add multiple email addresses from your organization. The forms auto flow right into our email marketing software and lead management software in case you want to market to these people down the road. Website pages are unlimited. 3plains doesn't limit your growth, and we don't believe in charging extra for it either! 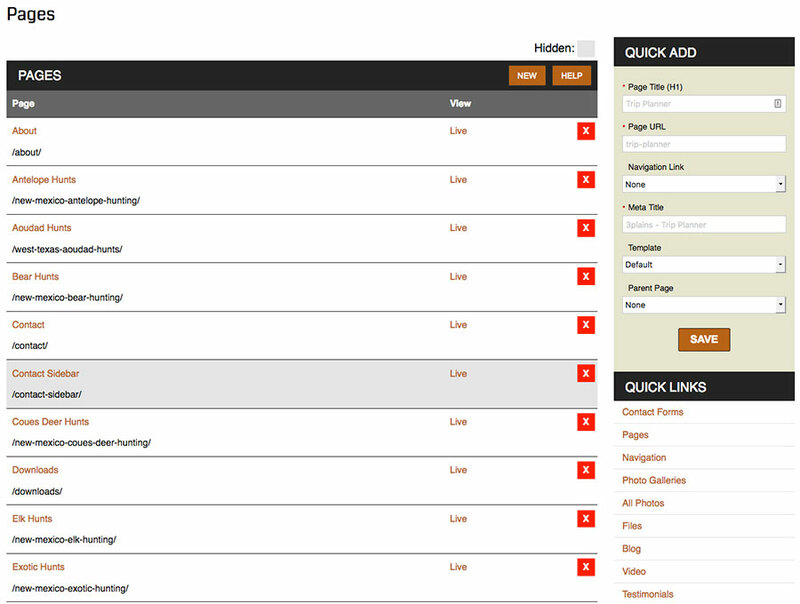 Feel free to create as many pages as you need with the 3plains CMS. It's as easy as clicking the Add a Page button, and giving your new page a title. Search Engine Optimization is key to any website business, and it starts with solid website architecture. Our 3plains CMS was built with this in mind. We believe it's paramount for you to be found on the search engines like Google, Yahoo, and Bing. You have all the tools to do all your own SEO. Photos are important to your business and your clients. 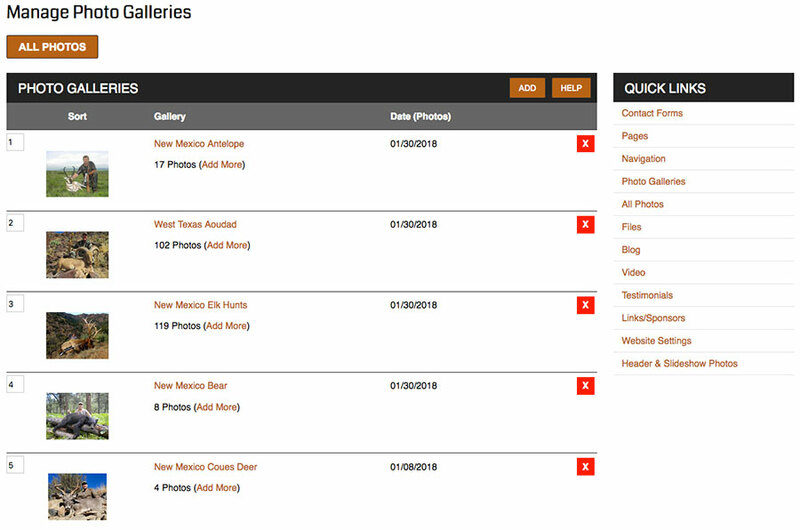 With our 3plains CMS you can create and manage as many photo galleries as you need. It's easy to use and you never have to worry about adding too many pictures. Highlight your photos or marketing message on your homepage or other pages with our slideshow manager. Upload all your own photos and our software will resize them for you on the fly. Easy! 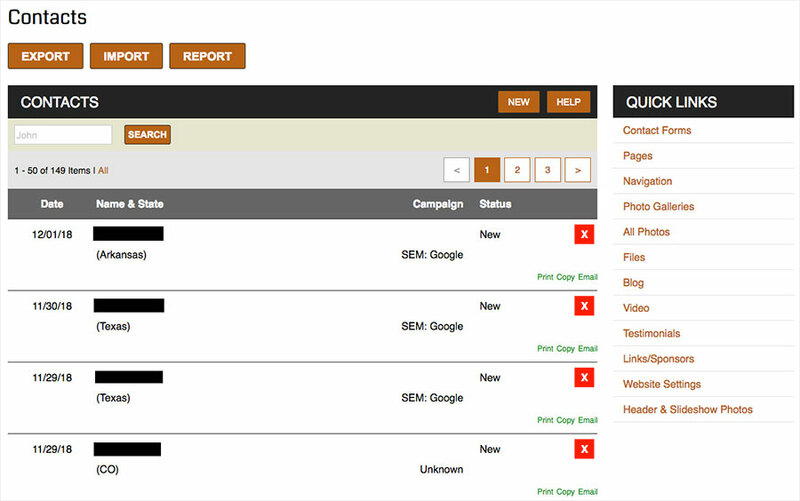 Manage your navigation links on the fly. Upload and add videos for your potential customers to see on your website in a organized fashion. Vimeo and YouTube capable embedding enables your customers easy viewing. Blogging is a great way to share information about your business with your customers, plus search engines love it. With the 3plains CMS, blogging is easy and it's built right in. There's no need to buy or download additional software, and your posts appear right on your own website where they belong. Need to sell products or services on your website? Simply add the optional e-commerce module to the 3plains CMS and start selling. Our system lets your customers make secure online payments. Accept Visa, Mastercard, Discovery, Amex or Paypal right on your website. Include a basic terms of service template and privacy statement. Have an idea? 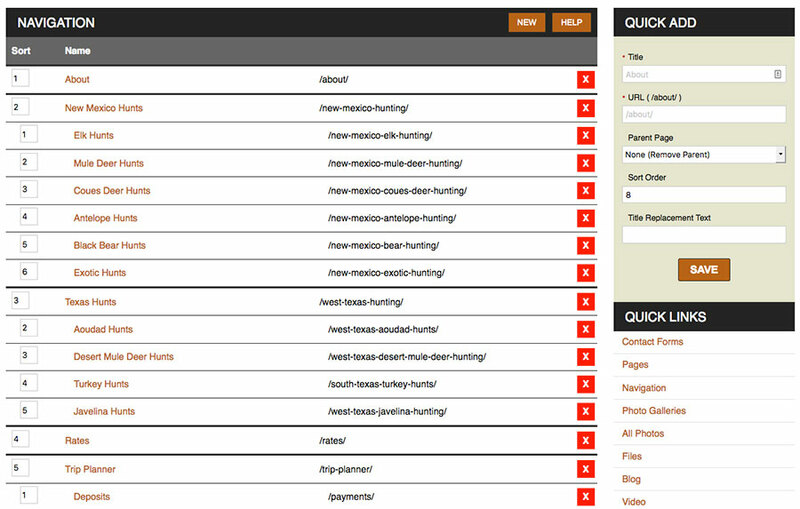 With our 3plains CMS, we can build add-on's or anything you dream up. We drink our own kool-aid and use our 3plains CMS to update 3plains.com. We flow in our Projects and Blog right on our front page to keep our website fresh for current and future customers.